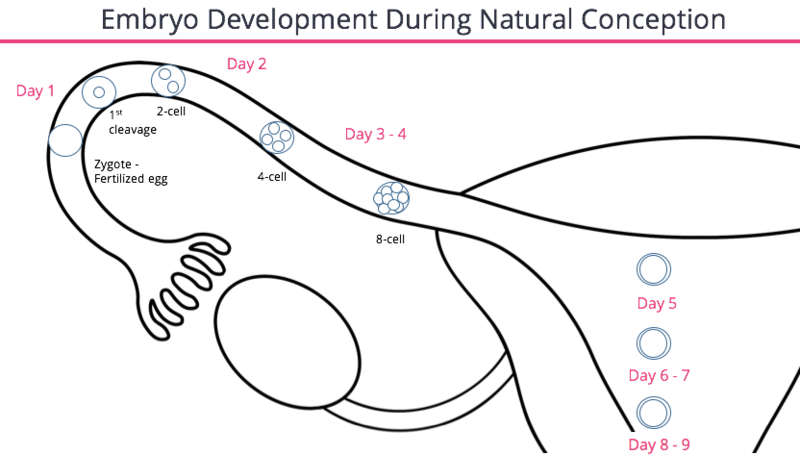 During natural conception, as you can see from the chart below, each day after fertilization the embryo develops more cells as it works its way from the fallopian tube into the uterus where it will approach the uterus’s wall, and hopefully implant and lead to a pregnancy. During IVF it’s the laboratory’s job to recreate the environment within the fallopian tube and uterus so that embryos can grow just as they do in the human body and be transferred into the uterus. Growing embryos is difficult, and for decades IVF laboratories were only able to “culture” (a clinical term for “grow”) embryos to the “cleavage” stage, when an embryo has only 5 to 7 cells. 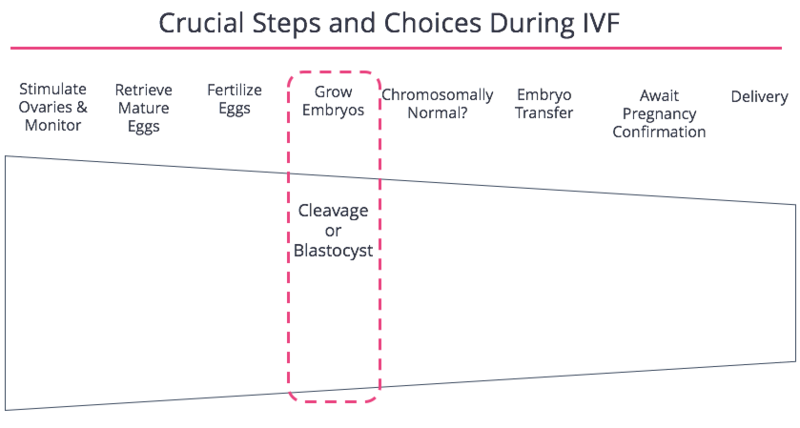 That worked reasonably well and most IVF babies born outside of the US are still born from embryos grown to the cleavage stage and then transferred. In the last decade, clinics have learned how to grow embryos to a more advanced stage, known as “blastocyst” — a stage when the embryo has developed at least 60 to 100 cells, and has differentiated parts that can be identified as an inner cell mass (the future fetus) and an outer layer (known as the trophectoderm) which is the future placenta. In many ways, growing embryos to the blastocyst stage weeds out less promising embryos before transfer because only the hardiest, strongest, most “developmentally competent” embryos can advance to the blastocyst stage. Unfortunately the lower quality embryos “arrest” or stop growing in the petri dish. However not all laboratories are able to grow embryos to the blastocyst stage of development, and not all patients create embryos that can reach this stage in the laboratory. As a result, there’s a debate about when to grow embryos to the blastocyst stage verses growing them only to the cleavage stage and immediately transferring them. Let’s take a look. A crucial concept to get down is that embryos that are grown to the blastocyst stage are far more likely to lead to a live birth than embryos that have arrived only at the cleavage stage. 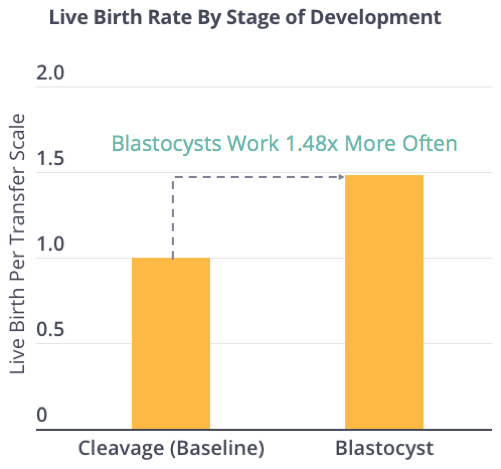 Below is an analysis of over 1,600 patients across 15 studies that demonstrates that transfers that use blastocysts are nearly 1.5x more likely to lead a live birth than transfers that use cleavage-stage embryos. 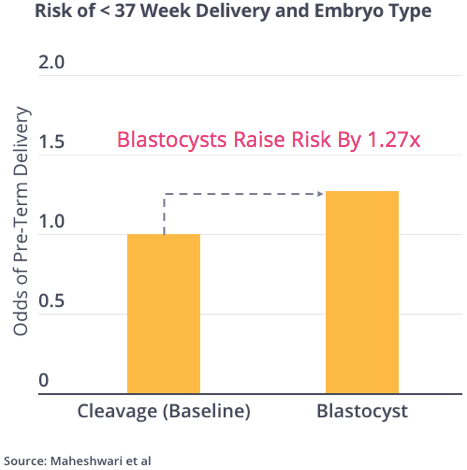 The net effect is that patients suffer fewer failed transfers when they have blastocysts transferred than when they have cleavage stage embryos transferred. An additional benefit of having more confidence in an embryo’s potential is that doctors and patients are much more prepared to transfer one embryo at a time. 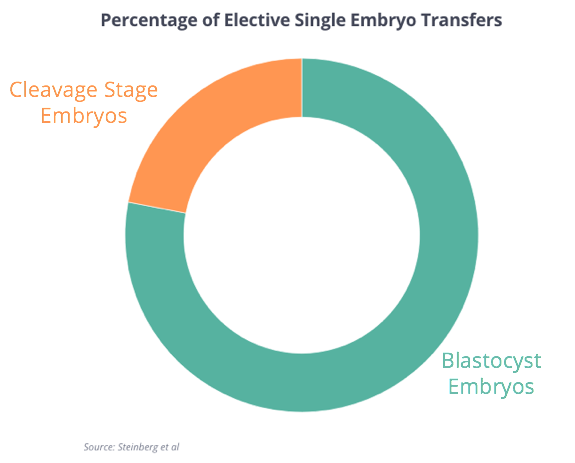 Below you can see data on all elective single embryo transfers in the United States from 1999 - 2010: nearly 80% were done using embryos grown to the blastocyst stage. 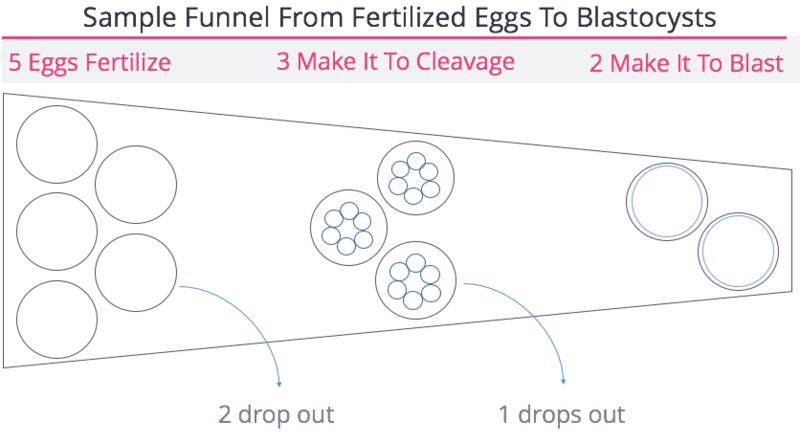 Just how reluctant were doctors to do a single embryo transfer with cleavage stage embryos? 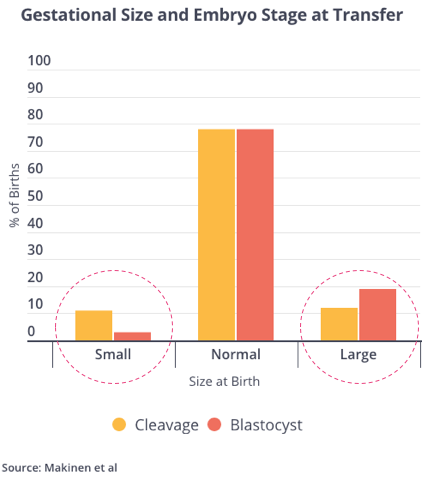 Less than 0.6% of transfers relying upon cleavage stage embryos occurred using just one embryo. 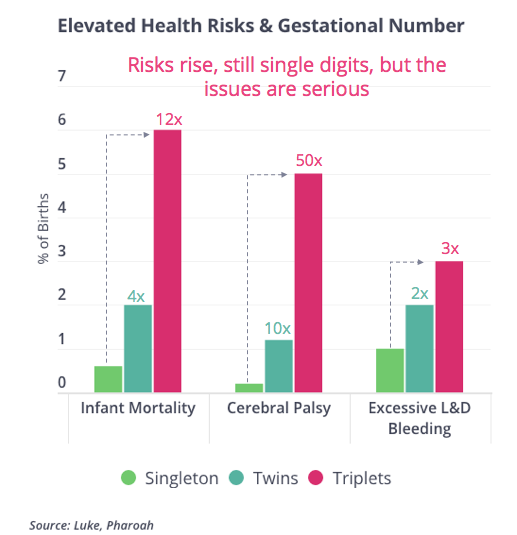 The reason that’s a important is because the likelihood of twins and triplets drops when embryos are transferred one at a time. As you can see below, twin and triplet pregnancies present a threat to both the mother and offspring. Thus, some would argue using blastocyst stage embryos is safer because it helps us avoid the temptation of risky transfer behavior that could endanger mother and offspring. Next, growing embryos to blastocyst helps if someone wants to have embryos genetically tested before transfer. As you’ll see in the next lesson, when testing predicts that an embryo has the wrong number of chromosomes, it almost never results in a live birth. As a result, genetic testing can help cut down on transfers that don’t implant or end in miscarriage. But it costs $5,000 and does not do anything to change the underlying quality of a patient's embryos, meaning it doesn’t change the odds that an egg retrieval cycle will work. Thus, many debate the value of genetic testing of the embryos. Genetic screening requires a fertility clinic to cut off a few cells from the embryo to test. 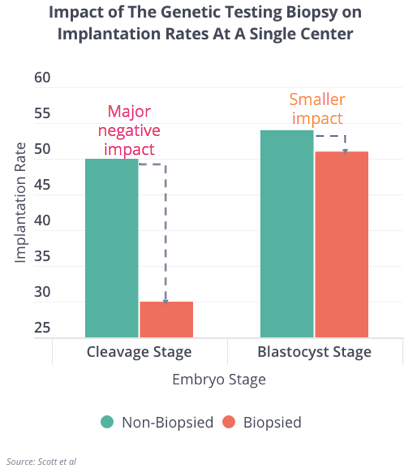 As you can see from a well-regarded (but still small, single center) study below, taking a few cells from a cleavage stage embryo does more harm than taking cells from a blastocyst stage embryo. The impact shows up in the form of lower implantation rates (and presumably lower birth rates). Thus, if you want to do genetic testing, it’s far safer to grow embryos to the blastocyst stage. In fact, if your clinic does genetic testing on cleavage stage embryos, that’s a red flag. In many ways, growing an embryo to the blastocyst stage and then genetically testing it applies two selection filters on which embryo to use. Should the transfer fail (remember, most do), having characterized the embryo as strong enough to reach blastocyst stage and as being “chromosomally-normal” often allows doctors to rule out the embryo as the “culprit” and focus their attention to possibly another issue, like the uterus. If any embryos is grown only to cleavage stage, it’s unclear if it was strong enough to reach the blastocyst stage and we weren’t given the chance to know if it was chromosomally normal. As a result, it can be harder to determine whether the cause of a failed transfer was due to poor embryo quality or another issue with implantation. Finally, growing embryos to the blastocyst stage can be a good idea if the patient wants to freeze embryos and transfer them later. As we’ll show in a future lesson, freezing embryos and delaying a transfer allows a woman’s hormonal balance to restabilize and for the transfer to happen when her uterus is most receptive. 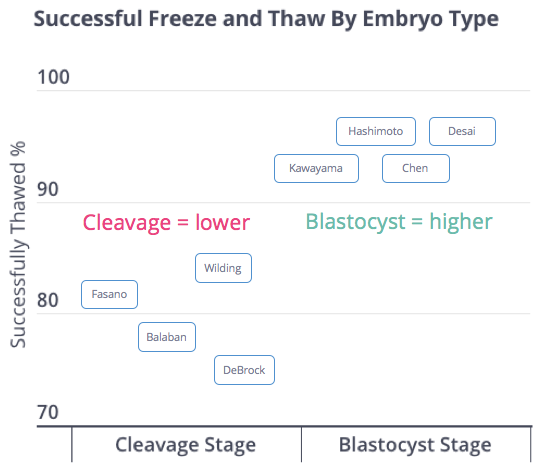 Many doctors believe the freeze-thaw process is more likely to go well with blastocysts rather than cleavage stage embryos. Below are the better run studies (the names in each blue box represent the study’s author) characterizing how often embryos are frozen and then thawed intact. As you can see on the right, over 90% of embryos that are frozen can be thawed intact. For cleavage stage embryos that number is in the high 70s to mid 80s. In practical terms, compared with blastocysts, this means one additional cleavage stage embryo will get lost for every ten frozen. In our minds that is a moderate difference and in the grand scheme of things is one of the slightly less compelling reasons to favor blastocysts over cleavage stage embryos. There can also be excellent reasons to grow an embryo to the cleavage stage, stop there, and transfer it. First and foremost, if your clinic is not good at growing blastocysts, but they’re competent at growing embryos to the cleavage stage, it may not be worth the gamble in trying to reach blastocyst. Below is our summary of how to tell whether a clinic is excellent, merely passable, or worse at growing blastocysts and cleavage stage embryos. A world-class laboratory can convert 60% of their fertilized eggs into blastocysts. If a clinic is at 40% or lower, this is likely not their strength. However, if they’re competent at growing embryos to cleavage stage, say 70% of the time, then it may be worth asking them to stop there so not to imperil your odds of having a few embryos left for transfer. 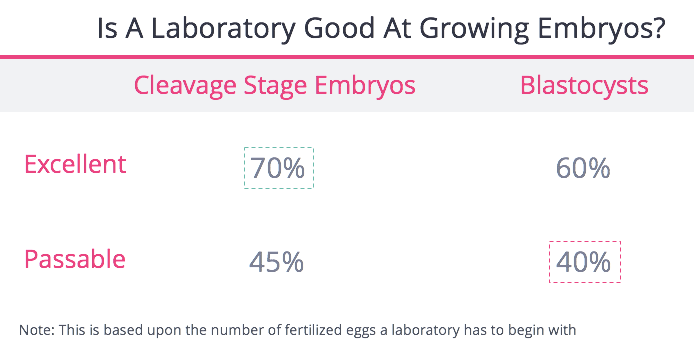 A last note about these numbers: these should be based upon averages of a lot of patients and it’s very possible a laboratory may do better, or worse, with your embryos. Next, some patients produce so few eggs and embryos that there’s no need to “weed out” any for transfer because there may only be one or two to choose from. Rather than try their odds bringing an embryo to blastocyst (again, a test that has less use in these patients) many doctors would rather stop growing the embryo at cleavage stage and get it back into the woman’s body which may well be a better environment for embryos to grow than in man-made laboratory. Those who disagree argue that “an embryo that can’t make it to to blastocyst stage in the laboratory wouldn’t lead to a live birth if transferred to the uterus at the cleavage stage.” We put this assertion in the “unknowable” bucket, because it’s impossible to go back in time and transfer embryos that ended up arresting before reaching the blastocyst stage. But what’s for certain is that if an embryo (regardless of stage) is not transferred, it cannot lead to a birth. This is an argument for the “any transfer is better than no transfer” camp and argument for growing embryos to cleavage stage. Or, transfer cleavage stage embryos and wait almost two weeks for quite-likely disappointing news. The positive here is you’ve given yourself a chance at pregnancy (remember, no transfer = no pregnancy). To the negative, if the transfer fails, you’ll have no idea why (embryos or uterus or both) and put yourself through waiting and heartache over two weeks. Finally, below is data that shows babies born from blastocyst transfers are more likely to be “large for gestational age” while babies born from cleavage stage embryos are more likely to be born “small for gestational age.” Both can be problematic depending upon the size and severity and yet, we should point out, both are the exception rather than the rule. What’s more, a higher percentage of babies born from blastocyst embryos are born before 37 weeks. Below is an analysis of seven studies that reveal there is 1.3x higher risk of this compared with cleavage stage embryos. While most babies born prematurely develop perfectly fine, prematurity is associated with a higher risk of short and longer term issues.